With over 12 million monthly uniques, mindbodygreen is one of the Internet's most popular destinations for all things health and wellness. Chock-full of first-person articles about everything from DIY apple cider vinegar to a divorce lawyer's secrets to a lasting marriage, the publisher provides pitch-perfect narratives that complement other confessional topic sites like hellogiggles and xoJane. Started in 2009 by CEO Jason Wachob, the company's downtown Brooklyn digs match its virtual aesthetic. "We call the look and feel of our website and our office 'Bohemian Brooklyn Sanctuary,'" said Wachob. 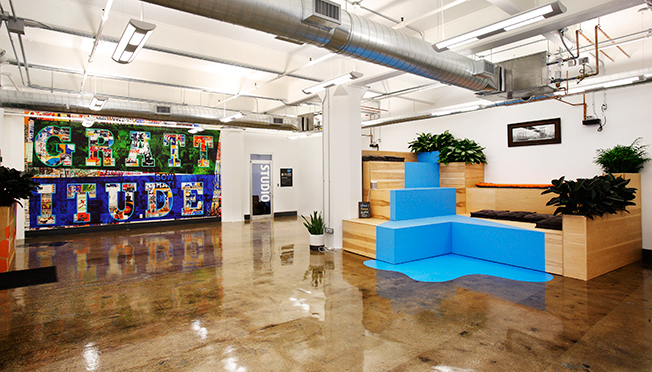 "We are a mission-driven company, so it was really important to us to create a space that reflected our values. From the meditation room to the 100-plus plants, to the fridge full of gluten-free beer and coconut water, to the Vitamix station, to the art and pictures that celebrate our community, our office is a reflection of who we are as a company. We worked with an incredible feng shui designer and member of our community, Dana Claudat on this project and she played a huge role in bringing our vision to life." The eco-friendly wallpaper is by artist Peter Tunney. A painting by Brooklyn-based graffiti artist CAM for mindbodygreen—there’s even a woman meditating in it, “as if she’s finding the calm in the chaos of Brooklyn,” said Wachob. Although the company currently counts 30 employees, it has expansion in mind and ensured the office space could accommodate up to 80 staffers. The Himalayan salt lamp was mined in Pakistan and helps to make the meditation room feel more like a sanctuary. This story first appeared in the Jan. 25 issue of Adweek magazine. Click here to subscribe.